Libya’s National Oil Corporation (NOC) reported yesterday that the country’s February oil revenues were down by 21 percent, or US$ 330 million, to US$ 1.26 billion compared to January. 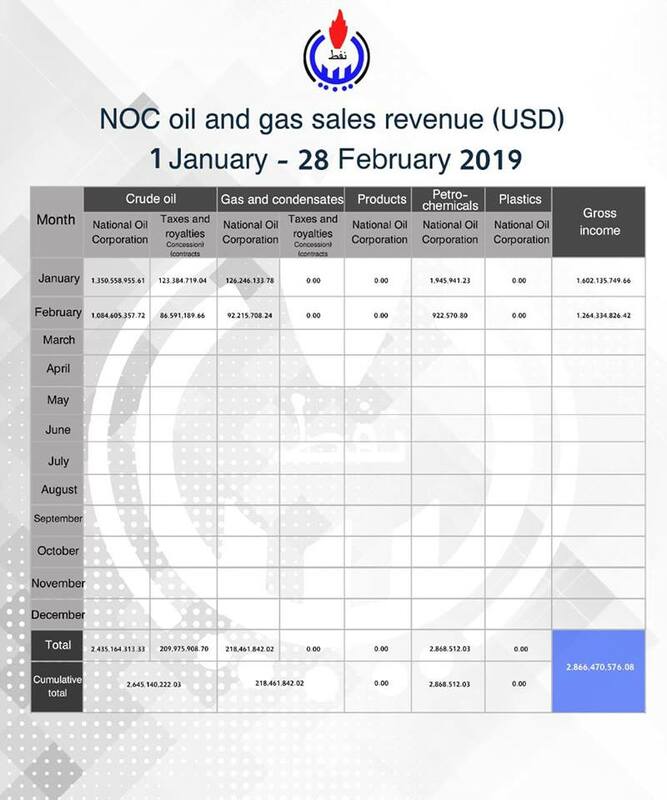 The NOC attributed the drop in oil revenues to adverse weather conditions affecting exports from its Es Sider port, in addition to the recent armed militia blockade and state of force-majeure at its Sharara oilfield that lasted until March 4, 2019. Commenting on the February figures, the NOC chairman, Mustafa Sanalla said “February revenues demonstrate the consequence of blockading and a weak security framework on our national finances. Following the resumption of production at Sharara, March revenue is set to rebound strongly. NOC has the ability to increase oil production up to 1.4 million bpd this year – if the security situation remains stable. Production outlook and potential revenue yield are completely attributable to the hard work of all workers in oil and gas sector in Libya. It is therefore imperative they be compensated with the long-standing promised oil sector pay-rise in line with government decree No. 642 of October 27, 2013. Sanalla has always claimed that he is keen to practice transparency when it comes to the NOC’s activities. However, critics have said he does not go far enough. In his statement yesterday, Sanalla added that ‘‘In the spirit of fairness, NOC is committed to the transparent reporting of national oil revenues. We are therefore keen to explore new cooperation opportunities with the Extractive Industries Transparency Initiative (EITI) to institutionalise our accountability to the Libyan people and build further trust”. The EITI is a leading international ngo concerned with encouraging more transparency in the extractive industries world-wide. Surprisingly but equally encouraging, the NOC included a quote from the EITI in its statement. “We welcome Libya National Oil Corporation’s commitments to transparency. These disclosures are good first steps in the long journey of bringing transparency and accountability in the governance of the oil sector in Libya. While Libya is not an EITI member country, we hope that this effort will spur further progress towards the country becoming a full member in the future” Mark Robinson, Executive Director of the EITI was quoted as saying. However, it must be recalled that the EITI, which participated in the Libya Transparency Roundtable in Tripoli in December 2011, encouraged the initiative, signed up to by the USA, whereby for better transparency, national oil corporations reveal their exploration and production contracts with their foreign partners. There have been calls by Libya’s private sector for much more transparency of all tender and procurement contracts especially with the larger companies to expose them to more competition.